Sublime walks are to make in the Natural Park of Luberon. Surrounded by unspoilt and untouched you through the hilltop villages of the Luberon charming. North of Vaucluse, your walks will guide you through the wild plains and the famous vineyards of the Côtes du Rhône. Near the Ventoux mountain, you gain altitude and go along steep mountains and lavender fields. 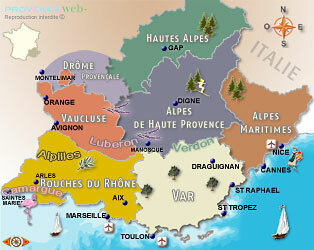 You can reach the Alpes de Haute Provence.